The province of Pontevedra is composed of the city of Pontevedra and of fifteen rural parishes. Like much of the western coast of Galicia, Pontevedra has a temperate, rainy climate, but with peculiarities stemming from its location surrounded by mountains and the ría. Temperatures are pleasant for most of the year (mild winters and summers). An ancient town and medieval port, Pontevedra has been described as a "definitive old gallego town". Sights include the pilgrim chapel in the Praza da Peregrina, the historic Zona Monumental (old city), the Praza de Leña, the market, and the Alameda, a promenade along the ría. One of Christopher Columbus' ships (the "Santa María") was built in Pontevedra. Isla de la Toja (A Toxa) is a small island paradise located in Rías Bajas, in the tourist heart of Galicia, next to O Grove and 30 km from Pontevedra city. The Toja (To Toxa) is famous for its magnificent spa, surrounded by a wonderful and idyllic landscape. Green vegetation and crystalline sea water make for a beautiful and relaxing location. The Hesperia Isla de La Toja is a modern hotel-spa complex with a white façade situated overlooking the sea in the Galician resort of O Grove, 36 kilometres from Pontevedra. Two tennis courts and a nine-hole golf course are situated nearby. Local attractions include Galicia Aquarium three and a half kilometres away, the beautiful Rias Bajas coastline 11 kilometres away, and Armenteira Monastery 13 kilometres away. Santiago de Compostela Airport is 85 kilometres from the hotel, with an approximate driving time of 65 minutes. Guests can soak up the sun on a sun bed by the lagoon- style outdoor pool, or enjoy a swim in the indoor pool. Those in search of relaxation can visit the Spa and Thermal Club or rehabilitation clinic; the spa boasts fitness equipment and a sauna. The Los Hornos Restaurant offers seafood and shellfish specialities served in a contemporary, minimalist setting, while La Arroceria's speciality is rice dishes. El Meson is the place to try traditional tapas and a wide selection of wines. The Hotel Louxo La Toja is a modern, five-storey property with a white façade, set on the seafront within one kilometre of the town's historic church and the aquarium. Those wishing to explore the area will find a nature reserve two kilometres away, and Combarro and the Armenteira Monastery are both within 25 kilometres. The hotel offers two dining options: Rias Gallegas serves a range of international and local fare and speciality fish dishes, accompanied by an extensive wine list, in a modern setting with sea views, while and La Garza, set in the hotel gardens, is an open-air restaurant offering a range of international dishes. A complimentary breakfast is served daily. At the thalassotherapy centre, guests can bathe in thermal pools, work out in the fitness room and relax with a sauna, massage or pampering beauty treatments. The hotel also houses an outdoor pool and hair salon. Sanxenxo is a municipality in Galicia, Spain in the province of Pontevedra. It is a popular tourism destination. 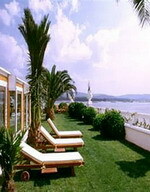 Sanxenxo is widely regarded as the best and certainly the most exclusive and expensive beach resort in Galicia. Sanxenxo has the highest beach side real estate prices in not just Galicia, but the whole of Spain and one Spanish survey suggested that they were the most expensive in Europe. The busiest time to visit Sanxenxo is in July and August when this normally semi-deserted town is full of tourists. The bay area at this resort enjoys some of the warmest waters in all of Galicia. The entire area around this beach mecca is full of outstanding beaches and numerous former fishing towns. Placed in Sanxenxo, capital town of Tourism in Galicia, our hotel represents the main Spa and Hotel Center in Galicia, offering the most modern facilities dedicated to the "Water Culture". Our Resort has 2 buildings with a exquisite and perfect decoration with all imaginable services... In our Spa, the ancient Zen Philosophy present in all formalities and learning basis of all its specialists, joins harmonically the most advanced technologies at your entire disposal. A place to dream and enjoy... Our resort consists of 2 buildings with a exquisite and perfect decoration with all imaginable services including 2 restaurants, 2 cafés, social and TV rooms. Entertainment for children is available during peak season... Furthermore we offer spa Augusta containing 3 heated pools, a heated dynamic pool with water beds, jet streams, lymph drainages and streams ..., 5 whirlpools, 2 saunas, 2 Celtic baths, relax room with warm anatomic sofas, oxygen therapy, Zen relax room ... Feel free to relax and unwind. Hotel OCA Vermar is a modern property set on the coastal road between Sanxenxo and La Toxa, 700 metres from the beach and three kilometres from Portonovo village. Vigo Airport is 43 kilometres from the hotel, a 50-minute drive. The outdoor pool is set in gardens dotted with sun beds and umbrellas, and guests can relax over lattes in the coffee shop and head to the bar for something a little stronger. 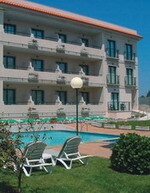 The concierge can recommend nearby sights and book tickets, and children have their own pool. Other practical amenities include business facilities, meeting rooms and translation services. The Vermar Restaurant serves traditional Galician food, including seafood specialities, accompanied by an extensive wine list in a light dining room with sea views. The Hotel OCA Vermar has 44 guestrooms with modern, colourful decor and functional furnishings. Situated one kilometre from the Galician fishing village of Portonovo, the Hotel Oca Galatea & Spa overlooks the ocean and is surrounded by the pinewoods and sandy beaches that characterise the region. Guests wishing to explore the area will find several fishing villages nearby including Sanxenxo five kilometres away, and Grove 10 kilometres away. The nearest airport is Vigo Airport, which is 50 kilometres from the hotel and takes around 40 minutes to reach by car. Guests are spoilt for choice with a range of massage treatments, after which they can take a dip in the indoor or outdoor pool, or relax in the spa or sauna. Younger guests will enjoy the supervised activities at the kids' club and the hotel has a babysitting service. The hotel has a modern bar and cafeteria-style restaurant, which serves light snacks such as sandwiches and burgers as well as a variety of drinks. 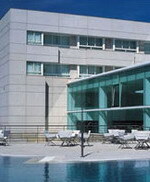 Hotel Royal Nayef, inaugurated in 2006 is located in Portonovo - Sanxenxo, in the heart of Rías Baixas, capital of tourism in Galicia. 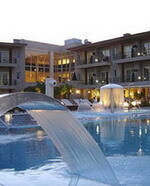 This attractive four-star hotel has an exquisite decoration as well as a large number of services for our guests. 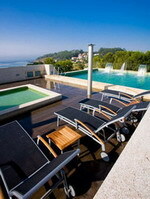 The hotel is placed in the village of Portonovo, at 100m from the beach of Canelas. You can enjoy the most comfortable and modern installations at Royal Nayef. The careful interior design is apparent throughout the hotel, especially in the rooms which are all sea oriented and nearly all have balconies where you can enjoy the fantastic views. There is also a cafe-bar, meeting room, garage and a superb outdoor pool with cascades. You can enjoy our different kind of rooms, from Double Room to Royal Suite. All of them are synonym of comfort. Tui - The frontier town of Tui lies close to the river Miño and is one of the most attractive and picturesque places in Galicia. Tui also has one of the richest, most varied and surprising historical and artistic heritages in Galicia. The most outstanding construction without a doubt is the Cathedral, located in the highest area of the town. This hotel in the historic city of Tui, on the Portuguese border, is a faithful reproduction of a pazo or Galician country house, in a setting of mountains and rivers. This establishment is ideal for sports and activities in natural surroundings. With its granite walls and floors, ceilings, beams and staircases of local chestnut wood, it recreates the typical pazo of the area. The gentle colours and rustic furnitire create a welcoming, soothing atmosphere in the comfortable bedrooms. There is also a splendid swimming pool and a beautiful garden. The food offered in the Parador is a treat for the most adventurous palates. Beef from Galicia, fish, rice with lobster, hake with Albariño wine, exquisite lampreys Tudense style, angulas al ajillo (eels, in season only), and San Ero cake are just a few of the delightful dishes we recommend. Albariños are the stars of the wine list, as the Parador is close to many of the most important producers of this denomination.